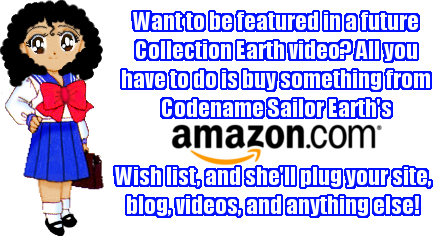 ​Come check out Codename Sailor Earth's first attempt at her own Japan-themed story, Ki-Chan: Demon Hunter! You can also read CSE's first book "Wrestling Between Ake and Bullard" on Kindle or via Paperback book! Tap THIS NOTE HERE to grab a $5 coupon for using the Amazon shopping app. Each review is done from an adult's perspective, more to the point, the perspective of a married adult and lifelong anime fan. Spoilers might be lurking about, along with shopping tips and content warnings. Reader's discretion is advised. Contrary to tween fiction, she is not a "weeaboo" she is a cosplaying anime fan, who is very comfortable being an American Quadroon. The term "Japanophile" known in Japanese as "shinnichi" is a little more appropriate for those who can spell above a 3rd grade level, while other anime fans are just happy to be general Otaku.